NASA's Apollo boilerplate Pad Abort Test-1 was launched on November 7, 1963. NASA on Thursday successfully tested an astronaut abort system, recreating a scene last staged during the Apollo program while building upon technology first demonstrated 50 years ago this week. "The Orion Pad Abort-1 team has successfully tested the first U.S.-designed abort system since Apollo," said Doug Cooke, NASA's associate administrator for theexploration systems directorate, at a post-flight briefing. "This system is much more advanced in capability and technology than any abort system designed in the past." The Pad Abort-1 (PA1) flight test, which flew a boilerplate 16-foot (4.9-meter) wide, 18,000-pound (8,160-kg) Orion capsule under a nearly 45-foot (13.7-meter)long launch abort system (LAS) tower, lifted off at 8:00 a.m. EDT from the U.S.Army's White Sands Missile Range near Las Cruces, N.M. The flight lasted about 135 seconds from launch until the module touched down about a mile (1.6 km) north of where it had lifted off. 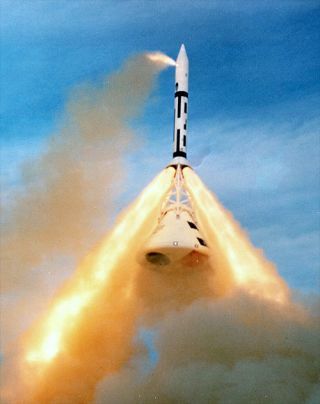 The flight, which was set up to model what would happen if an emergency on the launch pad required the spacecraft to separate from its booster, was the first fully-integrated test of this abort system design. The information gathered from the test will help refine design and analysis for future launch abort systems, resulting in safer and more reliable crew escape capability during launches, said NASA. Pad Abort Test-1 "on steroids"
The PA1 test was conducted under NASA's Constellation program, which a former NASA administrator described as "Apollo on steroids." Although President Obama has proposed in his budget for 2011 to cancel Constellation'sgoal of returning astronauts to the moon, development of Orion and technologies such as launch abort systems are included in his plan. Thursday's $220 million test hearkened back to a similar project that was part of NASA's first lunar program. Pad Abort Test-1 and -2 were conducted on Nov. 7, 1963 and June 29, 1965, respectively, also from White Sands. Like PA1 for Orion,they tested the capability of the Apollo launch escape system using boilerplate capsules on 165- and 112-second flights. They differed however both in the size of the spacecraft - the Apollo command module was about three feet less in diameter and 5,000 pounds lighter - and the configuration of the escape system tower. "One of the things about the Apollo system was that the nozzles were near the bottom," said Jay Estes, deputy manager of NASA's Orion Flight Test Office. "That put the thrust from the abort motor right next to your capsule." "What we've done is we put reverse-flow nozzles - theseare new - and that allows us to put the nozzles up on top of the abort motor and get those plumes away from the capsule. So it helps minimize the effect of flying through your own plume to get away," he said. The test involved three motors. An abort motor produced a momentary 500,000 pounds (227,000 kg) of thrust to propel the Orion boilerplate away from the pad. It burned for approximately six seconds, accelerating the capsule to a speed of about 445 miles per hour(mph, or 716 kph) in the first three seconds, with a maximum velocity of 539 mph (867 kph), in its upward trajectory to about 1.2 miles (1.9 km)high. The attitude control motor fired at the same time as the abort motor and steered the vehicle using eight thrusters producing up to 7,000 pounds (3,200 kg) of thrust, keeping the Orion module on a controlled flight path and reorienting it as the abort system burned out. "One of the differences with the Apollo motors was that it was a passive design," said Estes. "They used a couple of wind vanes up on the top to help get reorientation going and they'd a bunch of ballast up there to keep it statically stable." "By using an attitude control system, like [PA1's] attitude control motor, we don't need that ballast anymore, so we are saving weight, and it gives us more control in difficult areas such as transonic and maximum dynamic pressure so that we can knock out abort'black zones' - the zones where we can't guarantee a crew would be saved." "The attitude control motor is similar to what we use to steer missiles but it's about three to four times bigger than any other motor of this type," remarked Estes. "It is brand new and it is probably the most challenging component that we put in this vehicle." The jettison motor, the only motor of the three that would be used in all nominal rocket launches, pulled the entire escape tower away from the capsule and cleared the way for parachute deployment and landing. After the tower separated the system from the spacecraft,the recovery parachute system deployed. Two drogue and then three main parachutes guided the Orion boilerplate to a safe touchdown at 16.2 mph(24 feet per second, or 26 kph), 6,919 feet (2,100 m) downrange. The capsule, and whatever remains of the tower after free falling to the ground, were to be recovered and studied. The mock Apollo spacecraft used for the earlier pad abort tests met separate fates. Boilerplate-6 (BP-6) used for the first test was scrapped in 1975; Pad Abort Test 2's BP-23 is displayed in Huntsville, Alabama, as part of the Saturn V at the U.S. Space & Rocket Center. The first test of a launch escape system intended for use on a U.S. manned spacecraft took place on May 9, 1960. Beach Abort used the first production Mercury capsule on a 76-second flight from NASA's Wallops Island, Va., test facility.After reaching 2,465 feet, the spacecraft was lowered by parachute about one mile (1.6 km) away into the ocean. A Marine helicopter recovered the spacecraft 17 minutes later. It's now exhibited at the New York Hall of Science in Corona Park, N.Y. In the 50 years of testing, no U.S. launch escape system has ever been activated during a crewed flight. The Soviet Union however, experienced two manned aborts, of which the Soyuz T-10-1 mission in September 1983 became the one and only in history to fire off the pad (the other, Soyuz 18a or 18-1, jettisoned in flight). Only NASA's Mercury and Apollo programs used escape towers.Gemini, the two-man program that came between them, employed ejection seats, as did early test flights of the space shuttle. "We were never able to put any type of abort system on shuttle, but for future vehicles this is capability that we'll have,"said Cooke. "[We] have now demonstrated [it] and it just looked terrific." Clickthrough to collectSPACE.com to view video of the Pad Abort-1 and Beach Abort flight tests. How Can Astronauts Escape From an Exploding Rocket?